In a large mixing bowl add all ingredients for the burgers and mix well. Using a 1/4 cup measuring cup form patties. If using hands to mix, dip fingers into a small bowl of water will help to prevent turkey from sticking to fingers. Heat a large frying pan over medium- high heat. Add a few tbsp of oil. Working in batches cook burger patties for about 5 mins per side making sure to not press down on burger with spatula. 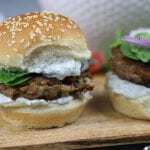 Serve cooked burgers with mini sized hamburger buns and garnish selections of choice.